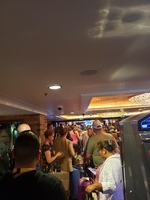 Getting into and through security was the easy part,everything after that was horrible food was cold,pool area was crowded,they never cleaned our cabin but wanted to charge a service fee per person $116 for four days. All activities and shows were always booked no matter what time of day. We only went to one island given we were to stop at 2 in total. Being on the water for 3 days out of our 4 day cruise was crap. The only thing good was being able to sleep. Getting off the ship disembarkation omg was horrible we woke up at 6 to be off at least by 730am we got delayed because of customs and waited in line for over 3 hours to get off the ship. No staff was available to help with line situations people were arguing the whole time. This was my first cruise and by far the worst experience ever. I will never book another cruise at least through Norwegian. Just horrible. Cabin was clean when arrived other than that they never came and cleaned it the remainder of our cruise.